A professional achievement that merits the Navy and Marine Corps Achievement Medal must clearly exceed that which is normally required or expected, considering the individual's grade or rate, training, and experience; and be an important contribution of benefit to the United States and the Naval Service. Leadership Achievement that merits the NA must be noteworthy, sustained or for a special achievement, and reflect most creditably on the efforts of the individual toward the accomplishment of the unit mission. Awarded to members of the Navy, Marine Corps, and Coast Guard (when the Coast Guard or units thereof operate under the control of the Navy) in the grade of captain/colonel and junior thereto, who have actively participated in ground or surface combat. Upon submission of evidence to their commanding officer, personnel who earned the Combat Infantryman Badge or Combat Medical Badge while a member of the U.S. Army may be authorized to wear the CAR. The principal eligibility criterion is that the individual must have participated in a bona fide ground or surface combat firefight or action during which he/she was under enemy fire and his/her performance while under fire was satisfactory. Service in a combat area does not automatically entitle a service member to the CAR. Awarded to members of the Selected Marine Corps Reserve (SMCR) who, effective January 1, 1996, fulfilled designated service requirements within any three-year period of service in the Organized Marine Corps Reserve. For the period 1 July 1925 through 31 December 1995, inclusive, a four-year period of service is required. A Selected Marine Corps Reserve Certificate (MAVMC 10592) will be completed by the commanding officer at the time entitlement is confirmed for presentation to the member con­cerned. A bronze star 3/16-inch in diameter is worn on the suspension ribbon and ribbon bar to denote subsequent awards. The eligibility requirements are three years of continuous active service, regular or Reserve. The MCGCM shall be earned for otherwise qualifying service involving no convictions by courts-martial, or nonjudicial punishment (NJP) under the Uniform Code of Military Justice, Article 15, and no lost time by reason of sickness-misconduct or injury-misconduct. 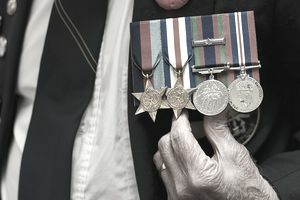 A Good Conduct Award Certificate (NAVMC-71) will be completed by the commanding officer at the time entitlement is confirmed for presentation to the member concerned. A 3/16-inch bronze star will be worn on the suspension ribbon and ribbon bar to denote subsequent awards. For three continuous active service as an enlisted person in the Regular Navy or Naval Reserve. Within the required period of active service, the individual must have a clear record (no convictions by courts-martial, no non-judicial punishments (NJP), no lost time by reason of sickness-misconduct, no civil convictions for offenses involving moral turpitude. Awarded to personnel of the Armed Forces of the United States participate as members of U.S. military units in a U.S. military operation in which encounters foreign armed opposition or imminent hostile action by foreign armed forces. The Joint Chiefs of Staff (JCS) shall designate operations which qualify for the Armed Forces Expeditionary Medal. The operations may be U.S. military operations or U.S. operations in direct support of the United Nations or assistance to friendly foreign nations. The operations may be in foreign territories, adjacent waters, or airspace. Ships and units which are present in an area merely for training purposes are not eligible for the award. They must be bonafide members of a unit engaged in the operation or meet one or more of several criteria for service in support of the operation. Strike/Flight Award. Awarded to persons who, while serving in any capacity with the Armed Forces of the United States, distinguish themselves by meritorious achievement while participating in sustained aerial flight operations under flight orders. Bronze numerals are worn to denote the total number of Strike/Flight Awards. Strike/Flight awards can only be approved within the parameters (area, time, etc.) established by the Secretary of the Navy; delegated authority of this award is specific in nature and always in writing. The Combat Distinguishing Device may be authorized for single mission Air Medals for valor (heroism) after 4 April 1974. General: Awarded to an officer and enlisted personnel of the United States Navy and Marine Corps. Each service has distinct criteria that delineate eligibility; Navy personnel assigned to Marine Corps units follow Marine Corps policy, and vice versa. Specific: For Navy and Marine Corps personnel assigned to U.S. (including Hawaii and Alaska) homeported ships/deploying units or Fleet Marine Force (FMF) commands, 12-months accumulated sea duty or duty with FMF which includes at least one 90- consecutive day deployment. For Navy and Marine Corps personnel assigned to overseas homeported ships/deploying units or FMF commands, 12-months accumulated sea duty or duty with the FMF. For those in this category, the 90-day deployment is not required. Changes to deployment patterns to meet operational commitments within fiscal constraints have resulted in the reduction of some service force ships deployment lengths to less than 90 days with an increase in the frequency of deployments. Consequently and effective 18 October 1991, the awarding of the Sea Service Deployment Ribbon to members of units that complete two deployments of at least 80 days each within a given 12-month period is authorized. This change is not retroactive.